Herbert N. Hamm: accountant and conference worker; born on 18 January 1919 in Halbstadt, Molotschna Mennonite Settlement, South Russia to Nicholas Hamm (31 December 1884, Lichtenau, Molotschna, South Russia – 8 April 1978, Abbotsford, British Columbia, Canada) and Elisabeth (Rempel) Hamm (15 September 1887, Gnadenfeld, Molotschna, South Russia – 26 December 1927, Alberta, Canada). He was the second child in a family of two daughters and two sons. On 29 April 1945 Herbert married Erna Frances Toews, daughter of Franz Peter Toews (1879-1978) and Helena (Berg) Toews (1894-1935). Herbert died on 18 July 1998 in Penticton, British Columbia. The Hamms immigrated to Canada in 1924 and settled in Gnadenthal, Manitoba. In 1927 they moved to a farm in Coaldale, Alberta. Here Herbert attended school, bible school, and was baptized in 1938. In 1941 he moved to Yarrow and in 1942 graduated from Chilliwack Senior High School. Herbert had a difficult childhood. When he was eight years old he took a fall and developed osteoarticular tuberculosis in his hip. He suffered from a fused hip joint until he underwent replacement surgery in his adult years. Shortly after his marriage he was diagnosed with pulmonary tuberculosis and suffered from this disease for nine years. Although limited by his physical challenges Herbert was active in many areas. He worked as an accountant for the East Chilliwack Co-op. He served as the treasurer of the British Columbia Conference of Mennonite Brethren Churches for 24 years. In his free time he taught Sunday school, sang in the choir, was an active member in a prayer band and served as treasurer for the Kiwanis Club. From Yarrow, Herbert and Erna Hamm moved to Chilliwack where they lived for over 20 years. Herbert retired in 1984 and they moved to Okanagan Falls. In 1991 he suffered a heart attack and stroke. They moved to Penticton in 1993. Herbert was an avid student of the bible. He was a quiet man of integrity and faith. Just before he died he had a special revelation from God. Unfortunately he was unable to articulate it but agreed joyously that "God is good!" GRANDMA (The Genealogical Registry and Database of Mennonite Ancestry) Database, 7.08 ed. Fresno, CA: " California Mennonite Historical Society, 2014: #84108. Hamm, Erna. "Hamm, Herbert N. (1919-1998)." Global Anabaptist Mennonite Encyclopedia Online. November 2014. Web. 24 Apr 2019. http://gameo.org/index.php?title=Hamm,_Herbert_N._(1919-1998)&oldid=127008. Hamm, Erna. (November 2014). 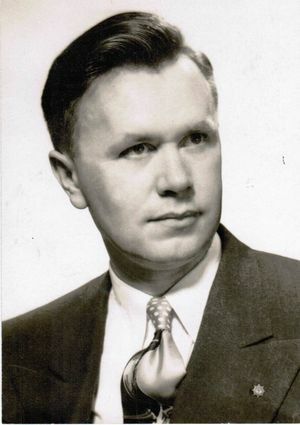 Hamm, Herbert N. (1919-1998). Global Anabaptist Mennonite Encyclopedia Online. Retrieved 24 April 2019, from http://gameo.org/index.php?title=Hamm,_Herbert_N._(1919-1998)&oldid=127008. This page was last modified on 19 November 2014, at 02:45.